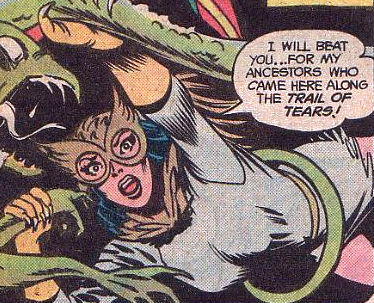 This week’s minorities in cartoons entry is Owlwoman, a DC Comics superheroine (real name: Wenonah Littlebird). Owlwoman first appeared in “Super Friends” #7 (August 1977), and was created by E. Nelson Bridwell and Ramona Fradon. Wenonah’s backstory is that she’s a Native American from Oklahoma. She’s the only American member of the global superhero team the Global Guardians. From what I could find, there’s some disagreement on what tribe she belongs to; it’s either Cherokee or Kiowa. Owlwoman first appeared in a “Super Friends” story that saw the JLAers team up with various heroes from around the world to stop an alien’s time bombs from blowing up the Earth. Wenonah’s next appearance, and the first one in mainstream DC continuity, came at the finale of 1985-86’s “Crisis on Infinite Earths.” Soon after, Owlwoman joined up with the Global Guardians. There, she struck up a relationship with another member, Irish hero Jack O’Lantern. Owlwoman stayed an active if minor heroine through the years. She was in the various incarnations of the Global Guardians, plus had an encounter with the villainous Queen Bee. Wenonah also took part in storylines like “Infinite Crisis.” Owlwoman also has a descendant in the 853rd century, who’s a member of that era’s Justice League. To date, Owlwoman’s yet to appear in the New 52 reboot. Despite her similar name, she has no relation to the villainous Owlman of the parallel world of Earth-3 (that Earth’s version of Batman), though Owlman precedes her by over a dozen years. Owlwoman’s powers are magically granted. They include the ability to fly by gliding on air currents (similar to the Silver Age Wonder Woman), as well as enhanced physical senses. The latter includes the ability to see in total darkness. Owlwoman also has strong navigation and tracking skills. After her encounter with the Queen Bee, Owlwoman also gained retractable claws that can slice through steel.